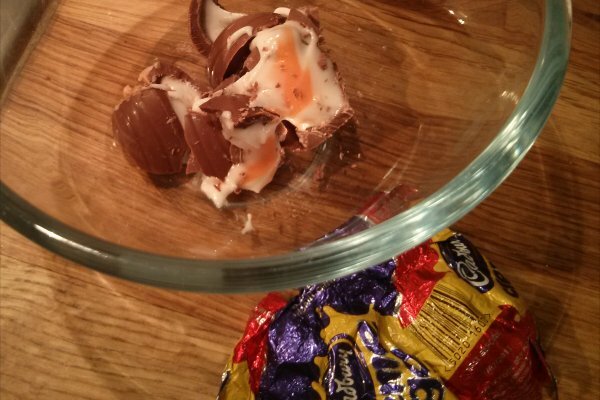 The internet is awash with recipes featuring Cadbury's Creme Eggs. Of course there are deep fried Creme Eggs (come on, who hasn't had one of those), but also creme egg doughnuts, milkshakes, brownies, and even creme eggs benedict (I really, really wish I'd thought of that first). It was a real challenge to come up with an original recipe, but I think I've done it. 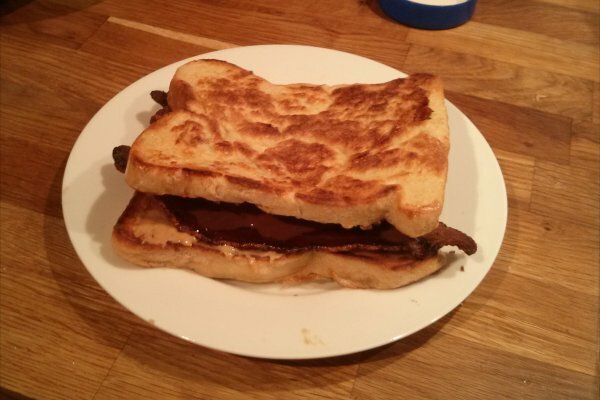 I give you, the creme egg and bacon sandwich. No ordinary bread would have sufficed for this sandwich. 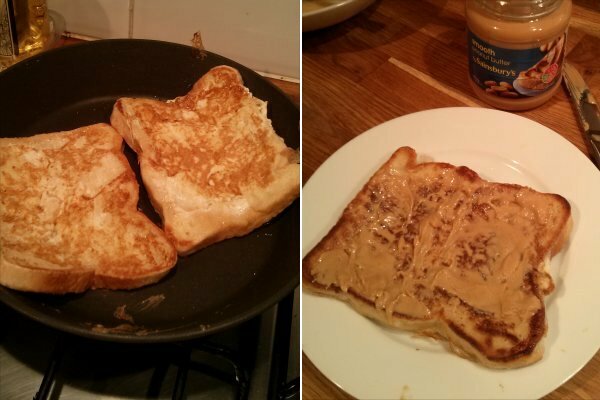 I used french toast - two slices of white bread, soaked in egg, and fried until brown and crispy. And then spread with a generous layer of peanut butter. 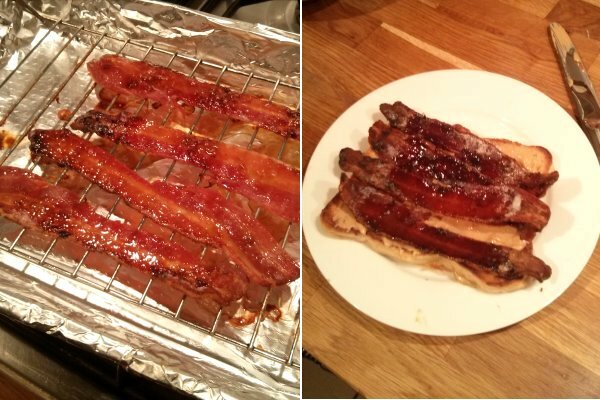 I used streaky bacon, because it crisps up much better than back bacon. 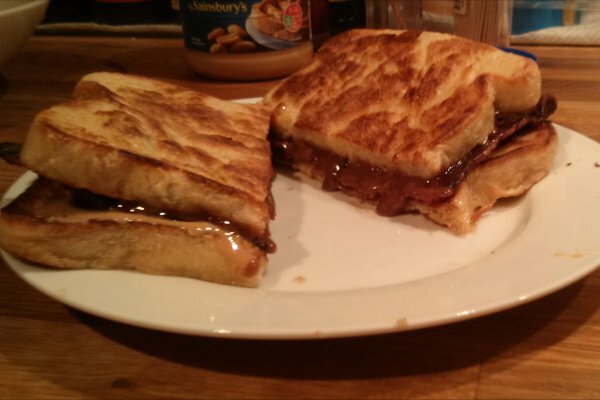 I brushed the slices with lots of maple syrup, and put them under a hot grill until ultra crispy. Finally the egg. I simply chopped it up, melted it down, and then poured it over the bacon. 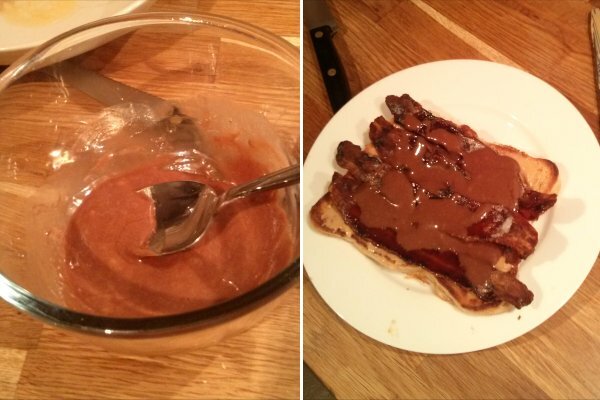 I was a bit concerned about the combination of bacon and sickly sweet creme egg - despite the fact that bacon desserts/cakes seem to be all the rage these days. But to tell you the truth I could hardly taste the bacon through all the sweet stuff, apart from a hint of saltiness. Which I decided was probably a good thing. I'm actually a little bit shocked. Didn't know that was still possible.